1. The Fret Method is a time-honored way to tune your guitar to itself without using slick and new-fangled electronic gizmos. With your guitar resting comfortably on your lap, here are the steps. a. Take your left index finger and push down the 6th or E string at the fifth fret. There should be a dot or marker at the fifth fret. Be sure to play in the space between the two metal bars. Push down hard enough with the tip of your finger so it produces a clear note. Then, compare the pitch of that note (A) with the 5th or A string played “open” (no fingers.) If they don’t sound the same, adjust the 5th or A string. b. Next, push your left index finger down on the 5th or A string at the 5th fret (D) and change the 4th or D string to sound like that. c. Fret the 4th or D string at the 5th fret (G) and change the 3rd or G string played open to sound the same. d. This time, fret the 3rd or G string at the 4th fret (B) and compare it to the 2nd or B string played open. If they don’t sound the same, change the 2nd string to match the 3rd string fretted at the 4th fret. e. Finally, fret the second or B string at the 5th fret (E) and compare it to the 1st or E string played open. If they don’t match, adjust the 1st or E string. 2. Music stores used to sell pitchpipes as the primary method to tune a stringed instrument. Nowadays, they’re going the way of the buffalo, the outhouse, and the corded telephone. If you can find a pitchpipe that’s made for a guitar, it could be useful, but is not very reliable when it gets old or if you blow too hard. Here’s what you do if you can get your hands on a pitchpipe. Each hole should be marked with the letter name of one of the strings. Gently blow on that hole and tune your string to it. Good luck! 3. Guitars can be tuned to any instrument that’s in tune. Take a piano, for instance. 4. Last, but not least, is the electronic tuner. I mention this option last because I feel strongly that you need to be able to tune your guitar without using an electronic gizmo, as sweet as it is. The tuner is best used to fine tune your guitar after you get it more or less in tune using one of the methods listed above. Visit your local music store and the salesperson will show you the pros and cons of the tuners they carry. Check out my article on Guitar Chords. 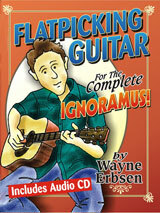 If you’re a novice, a beginner, or even a more advanced guitar player, I highly recommend my newest book, Flatpicking Guitar for the Complete Ignoramus! Here’s what you’ll learn from this fun book: How to Tune, How to Hold Your Pick, How to Do the Rest Stroke, How to Play Solid Rhythm, How to Play Back-Up Chords to 30 Old-Time Fiddle Tunes, How to Understand Painless Music Theory, How to Improvise, How to Fight the Fear of Scales and How to Play by Ear. You’ll learn to pick these tunes: Amazing Grace, Angelina Baker, Arkansas Traveler, Bill Monroe’s Shady Grove, Boogie Woogie, Bury Me Beneath the Willow, Cluck Old Hen, Cotton-Eyed Joe, Cuckoo, Darling Corey, Deer Lake Polka, Don’t Let Your Deal Go Down, Down the Road, Flatpicker’s Blues, Goin’ Across the Sea, House of the Rising Sun, In the Pines, Keep on the Sunny Side of Life, Little Maggie, Little Rosewood Casket, Little Sadie, Little Willie, Man of Constant Sorrow, Muley’s Daughter, On Top of Old Smoky, Poor Wayfaring Stranger, Rain and Snow, Red River Valley, Shady Grove, Shortenin’ Bread, Soldier’s Joy, Swannanoa Tunnel, Tater Patch, Train 45, Where the Soul Never Dies, Whiskey Before Breakfast, Wild Bill Jones, Wildwood Flower, Will the Circle Be Unbroken?